6 simple things that give you more energy right now! Would you like to have unlimited energy every day? Would it mean you’d exercise more? Play and travel more? Give more to your work? Use it to inspire, motivate and connect with more people? Below is my list of top tips from some of the recent health and energy programmes I’ve been on, including the juice fast at YogaBarn in Bali. and Unleash The Power Within, (UPW). They are working for me, and they might just work for your too! Why not pick one and give it a try? Or pick all seven and you’ll be on an unstoppable force of nature. The fastest way to change your energy is to move! Change your physical state. Act like you have energy, and you will feel it. Try it now. Stand up! Shake your body, put your hands in the air and jump a few times! You’ve been sitting down too long anyway. If you are feeling brave, shout “I FREAKIN ROCK” as loud as you can too! That will wake you up. Your physiology has a profound impact on your psychology. You already know this, right? Tony Robbins knows it too. That’s why he had us up, jumping, dancing and shouting regularly for 4 days during UPW. Here’s my video of us at 9 Saturday morning. We look a little crazy don’t we, but we had energy! The yogis amongst you will have been practicing this one for a while. They call it pranayama. It can be as simple as sitting still and breathing deeply into your stomach for a few breaths, to specific breathing patterns, regularly throughout the day. My preferred pattern uses the ratio of 1:4:2. Inhale for 4 seconds, hold for 16, exhale for 8, repeated 10 times. (Listen to Tony describe the 4 in 4 out version here at 1:10:30) Depending on the pattern you use, It’s an instant de-stresser, and energiser! I promise not all my recommendations will be social enterprises, but I had to include at least one, and Fifteen is the most famous example in London. 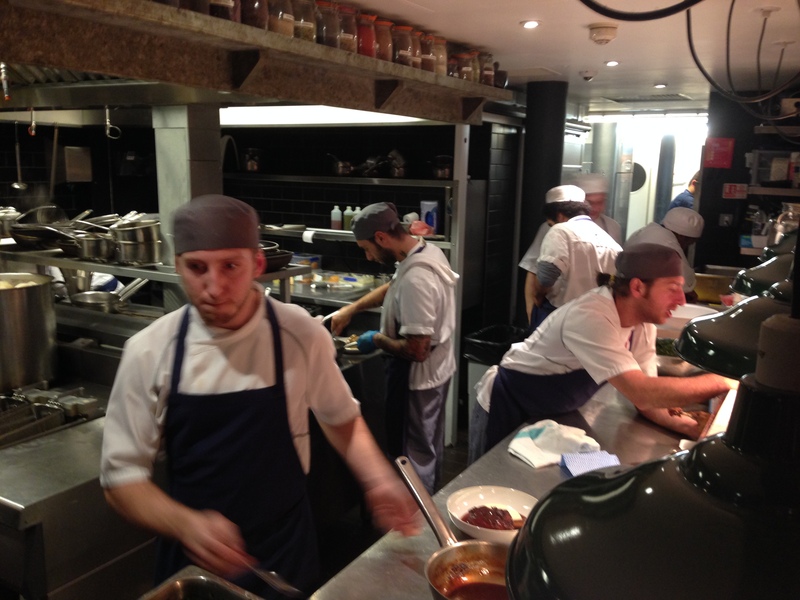 Operating since 2002, this restaurant takes 15 disadvantaged young people per year through a 12 month apprenticeship, in the skills of becoming a chef. The food is modern British, and scrumptious. For our large group, we were served sharing plates for mains. Passing these meaty plates around added to the feeling of being with your extended family during the holidays. Dessert was fantastic, with the chocolate mousse sticking in mind as especially delicious. Being associated with a high-profile figure like Jamie Oliver of course helps to promote the restaurant, and also promote the whole idea that a restaurant can be used for good. All profits from the restaurant are donated to the Jamie Oliver Food Foundation Charity, and over 350 students have now graduated from the three Fifteen restaurants in London, Cornwall and Amsterdam.